"Where the rivers flow and the Bluebonnets grow"
MAJOR ATTRACTIONS: See full details in City Directory below. Historic Rail Yard Complex: Turn of the century, restored train depot, trolley cars, Antler Inn Resort, antique filled Antler Inn, cabins, cottages, caboose accommodations, Junction House Restaurant & Lounge, restored 1800s log cabin, working cistern, courtyard, rolling lawns and Antique Shop. 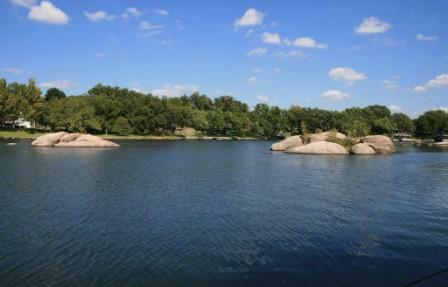 15 acres of woodlands and nature trails on he banks of Lake LBJ with frontage, fishing and boat docks. Overnight lodging, event venue and weddings. Listed, National Registry of Historic Places. See phone, address and history below. Falkenstein Castle: Located between Burnet and Marble Falls. A destination wedding castle with lodging and full catering services. Perched high on a hilltop surrounded by 113 acres of Oaks. Reception Center nearby in Burnet. Inks Lake Dam National Fish Hatchery: Raises fish for stocking of federal waters. Located near Kingsland and Longhorn Caverns. In 1873 it was the site of the Packsaddle Mountain Fight, the last major Indian battle in the area. 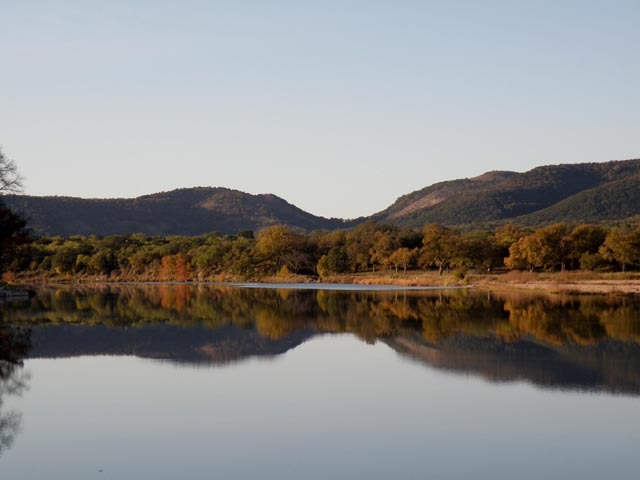 Handbook of Texas: "Its twin-peaked silhouette resembles a saddle from some perspectives. It is said to be the location of the Los Almagres mine, the object of Jim Bowie's searches for several years; records indicate that the Spanish operated a mine in the region. Prospecting on Packsaddle Mountain renewed interest in gold mining in Llano County in the 1920s, but with no lasting result. At an elevation of 1,628 feet, the higher of the two summits rises 650 feet above U.S. Highway 71. Local topography ranges from flat to rolling to steep, with local escarpments, covered with soils ranging from shallow and stony to deep, fine, sandy loams. Vegetation consists primarily of open stands of live oak and Ashe juniper. "; See Wikipedia; Texas Escapes; Google Map. Coordinates: 30° 37' N, 98° 30' W.
MEDIA COVERAGE: . See full details in Directory below. HISTORY: Handbook of Texas Online :"It was originally called Kingsville, for Martin D. King, who with J. M. Trussell had purchased the land on which it is located in 1877. The town was the site of a cotton gin and a small trading center in the 1880s. Activity increased with the extension of the Austin and Northwestern Railroad to Llano through Kingsville in 1892. By 1901 the community was known as Kingsland and had become the location of a growing number of businesses, including the Antlers Hotel, built by railroad interests. Kingsland had a reported population of 750 in 1907 but suffered a temporary decline, aggravated by a fire in 1922; in 1925 the population was reported as 150. The opportunities afforded by the Highland Lakes for retirement and recreational businesses had revived Kingsland by the mid-1960s as an regional commercial center, and in 1986 it had numerous businesses, including a national bank, and a population of 1,500. In 1990 the population was 2,725. The population grew to 4,584 in 2000." HISTORICAL MARKERS: See Texas Historical Commission's Historic Sites Atlas: http://atlas.thc.state.tx.us. Includes interactive map plus detailed descriptions of historical markers, cemeteries, museums, all searchable by county. CEMETERIES: See THC Historic Sites Atlas above. ANTLERS STATION, ANTIQUES, BUTTONS & BOOKS: 325-388-6221; 1006 RR-1431, Kingsland, TX 78639. At Antler Railyard Complex. LITTLE ANTIQUE SHOP: 325-388-9382; 1034 RR-1431, Kingsland, TX 78639. Antiques & furniture. SPLASH BOAT RENTALS & SALES: 325-388-5000; 1924 RR-1431, Kingsland, TX 78639. www.splashboatrentals.com. And boat service and repairs. HIGHLAND LAKES BAPTIST CHURCH: 325-388-3540; 716 RR-2900, Kingsland, TX 78639. EDWARD JONES: 325-388-6602; 1305 RR-1431 W, Ste B, Kingsland, TX 78639. www.edwardjones.com. Financial services. LEGENDS ON LAKE LBJ GOLF COURSE: 325-388-8888; 866-535-3525; 105 Range Way Cr, Kingsland, TX 78639. www.legendsgolftx.net. Public, 18 holes, 7260 yds, par 72. Tom Kite designed course with full practice facilities on NE edge of Lake LBJ. From Marble Falls, take RR-1431 W to CR-2342. LIGHTHOUSE COUNTRY CLUB: 325-388-6660; River Oaks & Skyline Dr, 118 Club Circle Dr, Kingsland, TX 78639. www.lighthousecountryclub.com. Map. Public, 18 holes, 6855 yds. Restaurant, lounge, snack bar. Wedding, banquet and event facility. Formerly PacksaddleCountry Club. TEXAS HOUSING FOUNDATION (THF): www.txhf.org. Mission is to promote adequate, affordable housing, economic opportunity, and a suitable living environment for the families they serve, without discrimination. Goal is to be the area’s affordable housing of choice. Government funded. FALKENSTEIN CASTLE: Castle: 7400 Park Road 4, near Kingsland. Office: 512-715-0330; 401 Buchanan Dr, Ste #1, Burnet, TX 78611. www.falkensteincastle.com. Located between Burnet and Marble Falls, 5 mi NE of Kingsland, 1 mi W of Longhorn Caverns. A destination wedding castle with lodging and full catering services. Perched high on a hilltop surrounded by 113 acres of Oaks. Reception Center nearby in Burnet. BUDDIES CONVENIENCE STORE: 325-270-3744; 1621 RR-1431, Kingsland, TX 78639. Facebook. And fried chicken! GEORGE WINFIELD-PIANO TUNING: 325-388-6252; Kingsland, TX 78639. And keyboard music for weddings & special occasions. KINGSLAND HOUSE OF ARTS & CRAFTS: 325-388-6159; RR-1431 & 112 Chamberlain St, Kingsland, TX 78639. www.kingslandcrafts.com. Just off RR-1431 near the bridge. WINDCHIME AT THE VILLAGE: 325-388-3502; 216 Covenant Ln, Kingsland, TX 78639. Assisted living & memory care. COURT APPOINTED SPECIAL ADVOCATES (CASA): Texas CASA. A non-profit organization with adult volunteers willing to stand up for an abused or neglected child. A CASA volunteer is appointed by a judge to provide factual information to the court on behalf of a child caught in a difficult legal process. A CASA speaks on behalf of the child’s best interest. DISABLED AMERICAN VETERANS (DAV): www.dav.org. An organization chartered by Congress for disabled military veterans of the US Armed Forces that helps them and their families through various means. Any veteran with a service-inflicted disability is eligible. Local: Highland Lakes, Chapter 198, 830-613-1908; Located at the intersection of RR-1431 and RR 2545, Kingsland, TX 78639. The chapter also helps with the Highland Lakes Honor Guard, and operates a thrift store (see "Misc" section). CHILI APPRECIATION SOCIETY INTERNATIONAL (CASI): www.casichili.net. A non-profit chili cook-off organization, with annual with regional and local events that are family-friendly and fun, and promote American red chili. Proceeds donated to local charities and non-profit organizations. Local: Highland Lakes POD Chapter, 325-388-4653; 11351 W Chamberlain St, Kingsland, TX 78639. Chili cook-offs support American Legion-Kingsland, see below. KINGSLAND CLOTHING CLOSET: A non-profit that provides assistance to the needy, including clothing. Cash and item donations welcomed. LAMBDA NU CHAPTER #5214: 325-388-8430; 713-906-4981; POB 1649, Kingsland, TX 78639. Service organization. Sign rental fundraiser. MASONIC LODGE: A fraternal organization that promotes Freemasonry, which includes charitable work within a local or wider community, moral uprightness, and friendship. MISSION U-TOO: 512-537-5612; 3435 RR-1431, Kingsland, TX 7863. www.missionutoo.org. A non-profit drug rehabilitation facility that also provides meals and living essentials. Cash and item donations welcomed. SHARING THE HARVEST: 325-388-0620; 3425 RR-1431 W, Kingsland, TX 78639. A non-profit food pantry (partner with Central Texas Food Bank), open 9a-noon, Thursdays, and provides people in need with non-perishable food. TOWNEPARK KINGSLAND: 325-388-8137; 101 TownePark Dr, Kingsland, TX 78639. Web. Affordable housing apartments provided by Texas Housing Foundation (see State Gov't section above). Units for seniors aged 55 and above. VETERANS OF FOREIGN WARS (VFW): www.vfw.org. A congressionally chartered organization that works on behalf of American veterans by lobbying Congress for better veterans' health care and benefits; and maintains a nationwide organization of employees and volunteers to assist veterans with their VA disability claims; and donates millions of dollars and hours for community service. KINGSLAND K9 SAFEHOUSE: 325-265-2388; 536 Midland St, Kingsland, TX 78639. Facebook. Mission is to provide a safe loving foster home for dogs that are in shelters or rescues & to find loving homes for the unwanted, abused & abandoned. Note: See separate listing sections for horses, riding, equestrian, and other care. CLUB CAR BAR: 325-388-6022; 1010 King Ct, Kingsland, TX 78639. Facebook/a>. Located along side Grand Central Cafe (see below). LLANORADO LODGE & BAIT SHOP: 830-388-4823; 223 RR-1431, Kingsland, TX 78639. www.highlandlakes.com/llanorado. KIDS CONNECTION LEARNING CENTER: 325-388-9000; 1012 Davis St, Kingsland, TX 78639. Facebook. 1 week to public school age. SHEILA'S FAMILY PRESCHOOL: 830-220-1767; 2200 Indian Trail, Kingsland, TX 78639. Licensed home pre-school. CENTRAL TEXAS ELECTRICAL CO-OP (CTEC): HQ: 830-997-2126; 800-900-2832; 386 Friendship Ln, Fredericksburg, TX 78624. www.ctec.coop. Electrical service; Excede satellite internet service. FRONTIER COMMUNICATIONS CORPORATION: 844-295-3268. https://frontier.com, http://internet.frontier.com/Texas. Successor to Verizon's DSL internet service. No local stores/offices. No service area map. LOWER COLORADO RIVER ASSOCIATION (LCRA): 800-776-5272; 3700 Lake Austin Blvd, Austin, TX 78703.www.lcra.org. LCRA plays a variety of roles in Central Texas: delivering electricity, managing the water supply and environment of the lower Colorado River basin, developing water and wastewater utilities, providing public recreation areas, and supporting community and economic development. PEDERNALES ELECTRIC COOPERATIVE (PEC): www.pec.coop. A Texas non-profit corporation owned by its members, the largest electric cooperative in the country, coves 8,100 square miles, 214,000 members, with assets over $1 billion. PROGRESSIVE WASTE SOLUTIONS (formerly IESI, now aka Waste Connections): Austin HQ: 866-282-3508; 877-307-4374. www.progressivewaste.com. Trash removal service. Serves: Bulverde, Johnson City, N Blanco Count, Marble Falls, Wimberley, Woodcreek, and more. VERIZON: www.verizon.com. Regulated land-line telephone service. DSL Internet service. Residential Service: 1-800-483-4000; Business Service: 1-800-483-5000; Repair-Residential Service: 1-800-483-1000; Repair-Business Service: 1-800-483-2000. Local service office: No local customer service office. OTHER LOCAL PROVIDERS: Cable TV: Northland Cable; Internet: CTECS, Zeecon, 281 Communications. 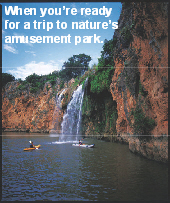 See options and full details in Marble Falls Directory, in Utilities section.